Place of abode; dwelling; the place where a man has his true, fixed, permanent home and principal establishment, and to which, whenever he is absent, he has the intention of returning. The place in which a man establishes himself with the intention of remaining there permanently, becomes, according to Jewish law, his domicil for all purposes, civil as well as religious. This intention may be either avowed or implied. When the intention is avowed he is immediately considered in all respects a member of the locality in which he has settled, and he is obliged to follow all the laws and customs peculiar to it. If the intention is not avowed it may be implied in different ways, as will be demonstrated. One who had lived in a place for twelve months, or who had bought a dwelling-house for himself, was compelled to share in the taxes and all other imposts levied on the people of that place (see Community, Organization of). If, however, he inherited a house, or a house was given to him in that town, it did not become his domicil, and he was exempt from the obligations placed on the citizens of the town. A residence of twelve months made the place his domicil only when he remained of his own free will. If he was compelled to stay there on account of sickness or the like, it was not considered his domicil. (B. B. 7b; Maimonides, "Yad," Shekenim, vi. 5; Shulḥan 'Aruk, Ḥoshen Mishpaṭ, 163, 2, Isserles' gloss). Regarding a man's obligation to contribute to the different charitable organizations of the town, the law varied. 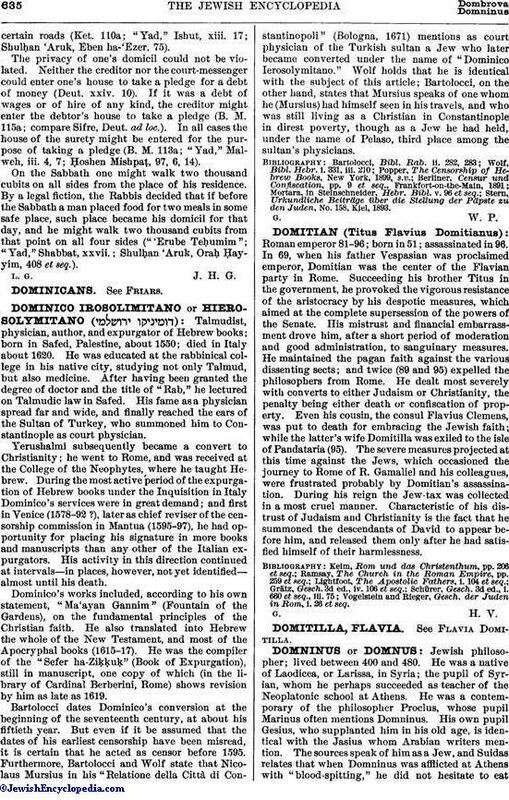 One who had lived in a place for thirty days was compelled to contribute to the free kitchen ("tamḥuy"); for three months, also to the general charity; for six months, also to the funds for providing garments for the poor; for nine months, also to the funds for defraying the funeral expenses of the poor; for twelve months, to all the expenses of the community (B. B. 8b; compare "Yad," Mattenot 'Aniyim, ix. 12; Shulḥan 'Aruk, Yoreh De'ah, 266, 5). 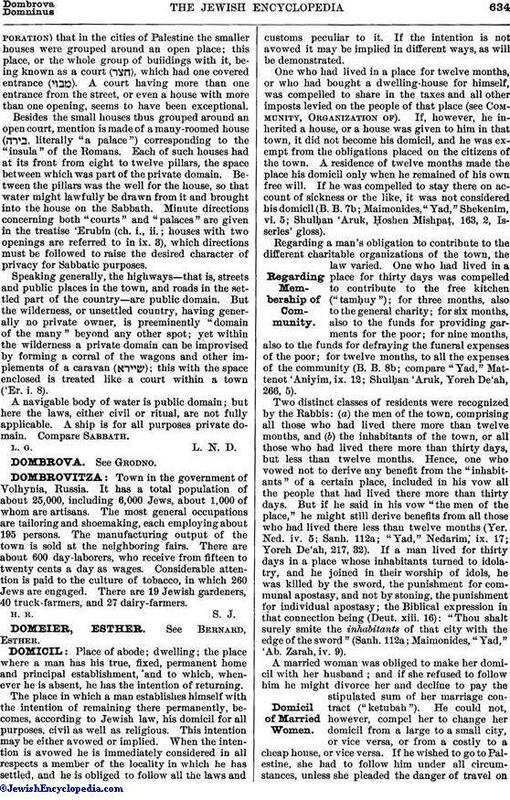 Two distinct classes of residents were recognized by the Rabbis: (a) the men of the town, comprising all those who had lived there more than twelve months, and (b) the inhabitants of the town, or all those who had lived there more than thirty days, but less than twelve months. Hence, one who vowed not to derive any benefit from the "inhabitants" of a certain place, included in his vow all the people that had lived there more than thirty days. But if he said in his vow "the men of the place," he might still derive benefits from all those who had lived there less than twelve months (Yer. Ned. iv. 5; Sanh. 112a; "Yad," Nedarim; ix. 17; Yoreh De'ah, 217, 32). If a man lived for thirty days in a place whose inhabitants turned to idolatry, and he joined in their worship of idols, he was killed by the sword, the punishment for communal apostasy, and not by stoning, the punishment for individual apostasy; the Biblical expression in that connection being (Deut. xiii. 16): "Thou shalt surely smite the inhabitants of that city with the edge of the sword" (Sanh. 112a; Maimonides, "Yad," 'Ab. Zarah, iv. 9). A married woman was obliged to make her domicil with her husband; and if she refused to follow him he might divorce her and decline to pay the stipulated sum of her marriage contract ("ketubah"). He could not, however, compel her to change her domicil from a large to a small city, or vice versa, or from a costly to a cheap house, or vice versa. If he wished to go to Palestine, she had to follow him under all circumstances, unless she pleaded the danger of travel oncertain roads (Ket. 110a; "Yad," Ishut, xiii. 17; Shulḥan 'Aruk, Eben ha-'Ezer, 75). The privacy of one's domicil could not be violated. Neither the creditor nor the court-messenger could enter one's house to take a pledge for a debt of money (Deut. xxiv. 10). If it was a debt of wages or of hire of any kind, the creditor might enter the debtor's house to take a pledge (B. M. 115a; compare Sifre, Deut. ad loc.). In all cases the house of the surety might be entered for the purpose of taking a pledge (B. M. 113a; "Yad," Malweh, iii. 4, 7; Ḥoshen Mishpaṭ, 97, 6, 14). On the Sabbath one might walk two thousand cubits on all sides from the place of his residence. By a legal fiction, the Rabbis decided that if before the Sabbath a man placed food for two meals in some safe place, such place became his domicil for that day, and he might walk two thousand cubits from that point on all four sides ("'Erube Teḥumim"; "Yad," Shabbat, xxvii. : Shulḥan 'Aruh, Oraḥ Ḥayyim, 408 et seq. ).